Police fired tear gas, trying to disperse hundreds of religious students who occupied Islamabad's Red Mosque on Friday and demanded the return of its pro-Taliban cleric, two weeks after a bloody army siege that left over 100 dead. Protesters threw stones at an armored personnel carrier and dozens of police in riot gear on a road outside the mosque. After protesters disregarded police calls to disperse peacefully, police fired the tear gas, and scattered the crowd which mostly fled back inside the mosque compound. A voice on the mosque loudspeaker — where a small group of religious students appeared to be in control — appealed for the protesters not to attack security forces, but the situation remained tense. The clashes spoiled a government attempt to reopen the mosque, which was stormed by the army July 10 after its pro-Taliban clerics had spearheaded a vigilante, Islamic anti-vice campaign that had challenged the government's writ in the Pakistani capital. The military siege sparked a wave of violence by militants across Pakistan — aimed primarily at the country's security services — which coincided with a U.S. intelligence report labeling the country's lawless tribal region as a growing al Qaeda safe haven. In the latest violence, gunmen opened fire Friday on a vehicle carrying the official spokesman for a provincial government in Pakistan's southwest, killing him, police said. Raziq Bugti, spokesman and special adviser to the chief minister of Baluchistan province, died at the scene after unknown assailants fired a barrage of shots into his vehicle as it passed by a school in Quetta, said Javid Ahmed, a local police officer. Earlier Friday, security forces stood by as protesters clambered onto the roof of the mosque and daubed red paint on the walls after forcing the retreat of a government-appointed cleric who was assigned to lead Friday prayers. The mosque protesters demanded the return of the mosque's pro-Taliban former chief cleric, Abdul Aziz — who is currently in government detention — to lead Friday afternoon prayers, and shouted slogans against President Gen. Pervez Musharraf. Police fired tear-gas at the protesters after they refused to leave the mosque. "Musharraf is a dog! He is worse than a dog! He should resign!" students shouted. Some lingered over the ruins of a neighboring seminary that was demolished by authorities this week. Militants had used the seminary to resist government forces involved in siege. The crowd at the Red Mosque shouted support for the mosque's former deputy cleric, Abdul Rashid Ghazi, who led the siege against Musharraf's forces until he was shot dead after refusing to surrender. "Ghazi your blood will lead to a revolution," the protesters chanted. 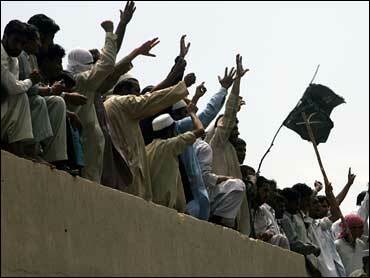 Dozens clambered on the mosque's roof to continue the protest, including one waving a large black flag. Armed police stood by on the street outside the mosque, but did not enter the courtyard where the demonstration was taking place. In a speech at the main entrance to the mosque, Liaqat Baloch, deputy leader of a coalition of hardline religious parties, the Mutahida Majlis-e-Amal (MMA), condemned Musharraf as a "killer" and declared there would be an Islamic revolution in Pakistan. Friday's reopening was meant to help cool anger over the siege, which triggered a flare-up in militant attacks and widespread anger that a religious site had been the scene of violence.